Ray Lovelock hears Basara stepping out of his apartment and just as he is about to leave asks Basara why he's going out, what's been bothering him lately and if he wants, he can always talk to him about it. Basara say's that he never really asked himself the reason why he sings and he's just only now trying to figure it out. In the sewer entrance that Basara takes to reach the sleeping Sivil, Mylene can be seen watching him then follows him in. At the forest Mylene see's that it is Sivil that he is singing to. She runs away and trips on Guvava who she left behind at the entrance. She asks him what she should do since Sivil is the enemy. She calls Milia but finds out that her mother is already asleep. Mylene does not insist to have her awakened. Basara leaves after finishing his song. Gigil approaches Sivil after Basara left and remarks that Basara might not really be able to wake up the sleeping Sivil. He is then seen leaving a wake of comatose people as he collects Spiritia from them. At this time the military tribunal on Battle 7 is discussing the recent attacks in City 7 and conclude that it could be Sivil (whom they call G3) behind it. They try to formulate a plan to capture her, but worry on the method, since she is powerful enough to stop Battroids by herself. Max then receives a call that Mylene wants to speak to her urgently so he requests that the participants take a break from the meeting discussion. 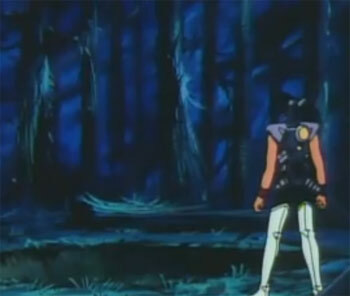 A distraught Mylene tells her father, Maximillian, that she saw Basara singing to the comatosed Sivil in the City 7 forest at the vegetation plant. Barton overhears the conversation and walks away hurriedly. Max tells her to go home and not to worry since he will take care of it. Barton sends a craft to retrieve Sivil from the forest. Basara arrives in his Battloid, hoping to use the sound boosters to wake her up but is surprised to find that she isn't there. Gigil also arrives in his Battloid with the Spiritia collected for Sivil. He accosts Basara upon finding Sivil gone and asks him where he took her, Basara asks the same from Gigil. As the two are grappling Mylene arrives and tells them to stop. Mylene confesses that she told her Dad about Sivil. Basara asks if the military was the one who took Sivil, she said she doesn't know. In a fit of rage Gigil takes Mylene hostage and points a gun at her head, he demands to Basara that they return Sivil. Sivil can be seen in Barton's lab. The military try to break into Sivil's energy barrier as it is preventing them from scanning her. Max is informed that Gigil has taken Mylene hostage in his Battloid. As he and Basara land in Battle 7 he proceeds to run amuck demanding that he be shown Sivil. He threatens to kill Mylene who he is holding in his Battloids hands. A stand off ensues with Battloids on the other end. Barton says that sacrifices must be made and says that they shouldn't give in to Gigil's demands. He orders the Battloids to fire at Gigil without regard for Mylene's life. They miss and just as he is about to crush Mylene in retaliation, Max shouts out the location of Sivil. Gigl breaks down the doors to reach to her. As he disembarks from his Battloid he takes hold of Mylene again and points a gun to her head. Max, Miria, Gamlin, Basara and the rest arrive at the lab. Max demands that Mylene be released but Gigil says only when they have escaped safely from the place. Basara starts to sing. Sound Energy escapes from his body towards Gigil and the sleeping Sivil. The energy calms the angry Gigil. Barton takes this as the opportunity to shoot Gigil, Max stops him afterwards. Barton hits him in the eye but does not kill him, a recovering Gigil activates the Spiritia in his Battroid, which fires to the sleeping Sivil. The Spiritia, together with Basara's sound energy, wakes up the sleeping Sivil. As Gigil is distracted by the waking Sivil, Gamlin takes this as an opportunity to knock Gigil away from Mylene. Gigil is about to shoot them but Sivil lets out a scream and flies off. Gigil forgets the rest and rides his Battloid to pursue Sivil, who by now has already knocked a hole into the side of Battle 7 to escape. Barton walks up to Basara and blames him for the protodevlin's escape. Just then Gamlin comes in to punch Barton. Some officers come in to hold him down. Milia tells them to let him go since Gamlin is under her jurisdiction. Gamlin apologizes to Milia for his brash action and Milia tells him that Barton deserved it. Mylene wakes up in Milia's house. She hurriedly gets up from bed and tells Milia that there is something she has to do. She runs towards the apartment complex looking for Basara but see's that he is gone along with his Battloid. Ray walks out to Mylene carrying a flower in a pot that Basara told them to take care of. The flower was found growing around Sivil in the forest. Mylene tells Ray that she was the reason why Basara left. Ray assures her that it was because he wanted to find out the reason he was singing for, that Basara left. Ray assures her that eventually Basara will come back. The episode ends with Basara Battloid's walking on a planet to some place.